Highland Paradise Maungaroa Cultural Centre celebrated 30 years of business last Saturday with a spectacular evening featuring a special line-up of cultural performances, both local and international. The event began with a welcome cocktail reception for around 180 guests at the Highland Paradise Museum/ Learning Centre, followed by an exclusive buffet dinner in the Are Karioi restaurant area. The entertainment for the evening began with an elaborate performance by residentdance troupe “E-Matike”, tracing ancestral linkages throughout Polynesia. The night’s entertainment concluded with a dramatic pulsating performance from visiting Australia dance troupe “Manea Pacifika”. The evening also featured an impressive solo number by current reigning National Expatriate Dancer of the Year, Marlon Rebollos. 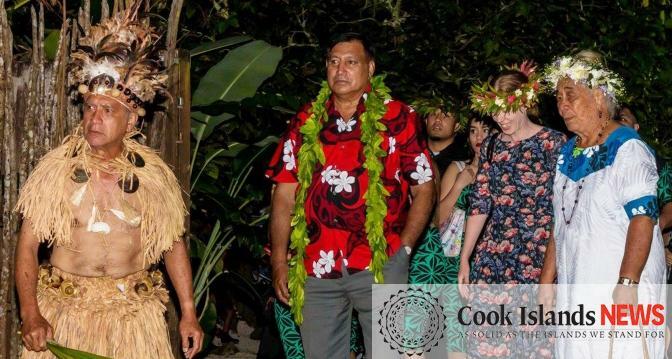 Formalities began with a speech from host managing director Teuira Pirangi who spoke of her father, the late Tuki Rangatira Raymond Pirangi Snr, his legacy and relentless determination to restore the ancient village of Maungaroa, one of just a few historical villages on Rarotonga. It was inhabited by Tinomana Ariki and his tribe before the arrival of Christianity in the early 1820s. The site was abandoned for well over a century, but during the early 1980s Raymond Snr began to clear and develop the site, which was finally established in 1987. Pirangi thanked the landowners, and local hoteliers whose support has kept this important heritage site alive and thriving. A special thanks was also extended to the Ministry of Education which has supported Maungaroa Highland Paradise, which is now currently under consideration as a UNESCO World Heritage site. Special guest speaker, Arama Wichman gave an overview of the business’s developments over the last 30 years. After starting with day tours for just 14 people a week, the business has grown significantly and around 400 people now visit the village every week. It was an emotional evening for close friends and family who have been part of the journey and growth of Highland Paradise. The vision for coming years involves further development and restoration of the extensive upper Maungaroa village, which is anticipated to be a lengthy, yet rewarding process for future generations. Highland Paradise has not only grown significantly as a business but has become a living legacy of cultural and historical importance. The first archaeological survey of Maungaroa Valley was conducted in 1962, with excavations taking place 10 years later in 1972. It was during the early 1980s that Raymond Snr realised the potential of this historic site and proceeded to make arrangements to clear acres of mountainous dense bush, which was no easy task. He sought village and tribal approval and with limited equipment and machinery, began clearing extensive tracts of bush, constructing access roads, tapping a natural water supply and connecting power. After opening for business on July 29, 1987, Highland Paradise began its first guided day tours, sharing with visitors and locals alike, the history of the Tinomana tribe and the traditional landmarks hidden in the Maungaroa valley. Sadly, the dream was cut short, in 1997, when Raymond passed away. Thirteen years later, in 2000, Tutu the daughter of the founder returned from New Zealand and decided that the legacy must go on and single-handedly began the laborious task of rebuilding Highland Paradise to its former glory. With little money and the inability to lease sacred land, she was forced to seek the financial means to begin restoring the site. She sought the assistance of a close network of friends and mentors. The Highland Paradise Cultural Centre was born and the vision continued.